This article is the first in a series of articles that will help the user to get familiar with power management components. The guide provides an introduction to different power management topologies, highlights the key selection criteria, and provides the on-line product parametric search and design support tools to help speed up the component selection of power management designs. Selecting a power management component depends a lot on the input and output conditions of the application. Is the input AC or DC? Is input voltage higher or lower than required output voltage? What is the load current? Maybe the load is sensitive to noise, or requires a constant current (for LEDs), or maybe it has a dynamically changing current? Based on the specific application requirements, different power conversion components could be selected. 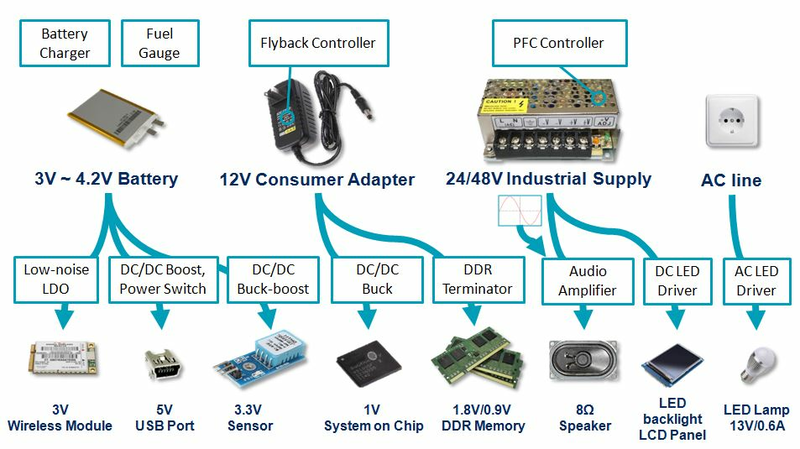 Below picture shows several examples of applications with their typical power conversion components, all if which can be found in Richtek’ portfolio. It is clear from the above examples that various parameters need to be considered for optimal component choice. The following section describes these parameters in more detail. Richtek has a large portfolio of LDOs (linear regulator) and DC/DC converters/controllers. The table below shows a quick view on general selection criteria for LDO and DC/DC switching converter products. The first step of design considerations is the input to output voltage difference. (VIN - VOUT). Specific application requirements like efficiency, thermal limits, noise, complexity and cost need to be taken into consideration in order to select an optimal power solution. 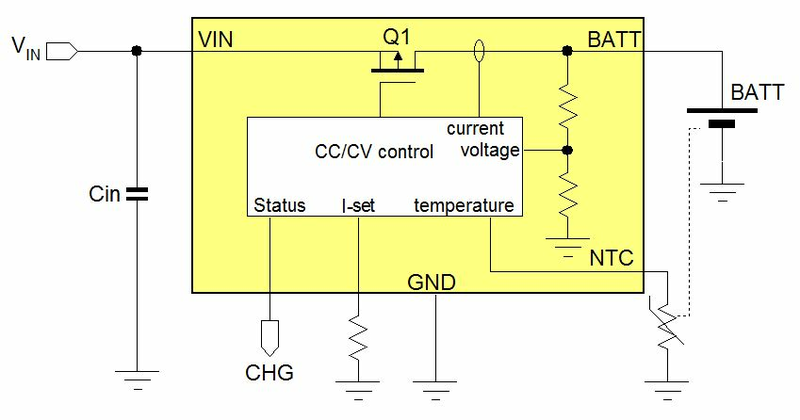 When VOUT is smaller than VIN, the application output current and VIN / VOUT ratio are critical criteria for choosing an LDO or a Buck. The Low drop out linear regulator or LDO is suitable for applications which require low noise, low current and low VIN / VOUT ratio. The basic circuit is shown in figure 2. LDOs regulate the output voltage by controlling the conduction of the pass element in a linear fashion. This linear regulation provides accurate, noise free output voltage which can quickly respond to load changes on the output. But the linear regulation also means that the voltage difference between input and output times the average load current is dissipated in the LDO pass element. Pd = (VIN - VOUT) * ILOAD , so high VIN / VOUT ratios with high load currents would lead to excessive dissipation. When selecting an LDO, one should consider the input and output voltage range, the LDO current capability and package dissipation capability. LDO dropout voltage is the minimum VIN - VOUT voltage where the device can regulate. In micro power applications, (i.e. applications that need to run from a battery for several years) the LDO quiescent current IQ needs to be low to avoid unwanted battery drain. These applications need special low IQ LDOs. Buck converters are switch-mode step-down converters which can provide high efficiency and high flexibility at higher VIN / VOUT ratios and higher load current. The basic circuit is shown in figure 3. Most Buck converters contain an internal high side MOSFET and low side synchronous rectifier MOSFET, which are in turn switched on and off via internal duty-cycle control circuit to regulate the average output voltage. The switching waveform is filtered via an external LC filter stage. 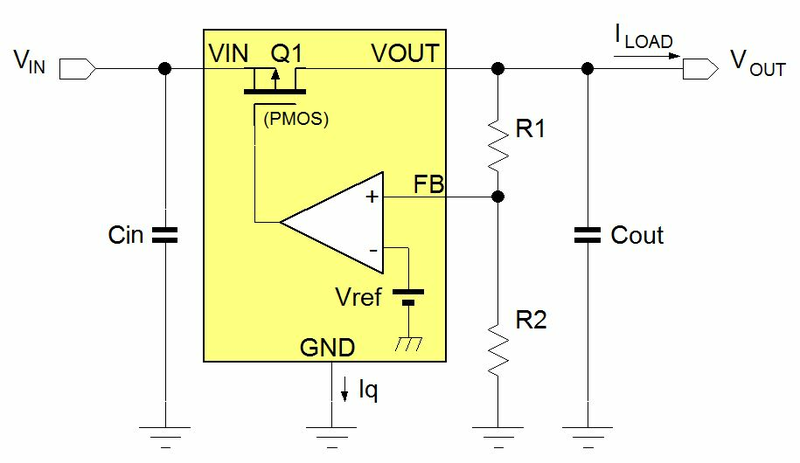 Due to the fact that the MOSFETs are either ON or OFF, they dissipate very little power, and the duty-cycle control makes large VIN / VOUT ratios possible. The internal MOSFETs Rdson mainly determines the current handling capabilities of the Buck converter, and the MOSFET voltage ratings determine the maximum input voltage. The switching frequency together with the external LC filter components will determine the ripple voltage on the output. Higher switching frequency buck converters can use smaller filter components, but switch losses will increase. Buck converters with Pulse Skipping Mode (PSM) will reduce their switching frequency at light load, thereby increasing light load efficiency, which can be important in applications with low power standby modes. Special Buck topologies like ACOT™ have very fast loop response and are very suitable for applications that exhibit very fast load transients, like DDR, Core SoC, FPGA and ASIC supplies. Boost converters are used when VOUT needs to be higher than VIN . The basic circuit is shown in figure 4. Boost converters will step-up the input voltage to a higher output voltage. This is accomplished by charging an inductor via an internal MOSFET switch, and discharging the inductor via a rectifier to the load when the MOSFET switch is off. The transition from inductor charge to discharge will reverse the voltage across the inductor, thereby stepping up the voltage higher than VIN. The on/off duty-cycle of the MOSFET switch will determine the VOUT / VIN boost ratio, and the feedback loop will control the duty-cycle to maintain stable output voltage. The output capacitor is the buffer element to reduce the output voltage ripple. The current rating of the MOSFET switch together with step-up ratio will determine the maximum load current, and the MOSFET voltage rating will determine the maximum output voltage capability. In some boost converters, the rectifier is integrated as a MOSFET to provide synchronous rectification. A Buck-Boost converter is used in applications where input voltage can vary, either below or above the output voltage. In the Buck-Boost converter as shown in figure 5, the four internal MOSFET switches will be automatically configured to form a buck when VIN exceeds VOUT and change to Boost operation when VIN falls below VOUT. This makes Buck-Boost ideal for battery-powered applications to extend battery life when the battery voltage falls below the regulated output voltage value. Due to the fully synchronous operation, the efficiency of the 4-switch Buck-Boost converter is very good. 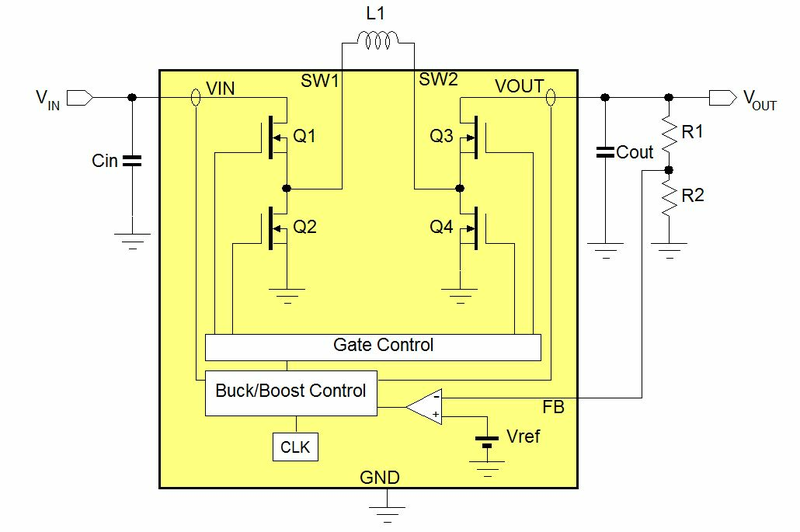 The output current capability in Buck mode is higher than in Boost mode, due to step-up requiring higher switch current at the same load conditions when compared to Buck mode. The MOSFET voltage ratings will determine the maximum input and output voltage range. 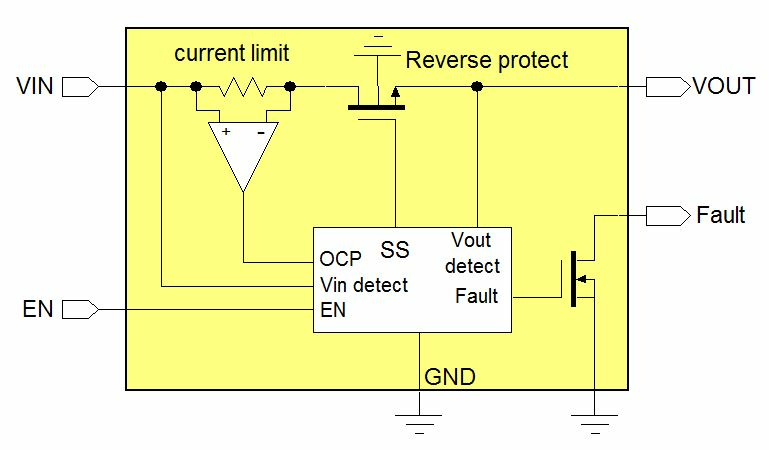 In applications where the output voltage does not need to be referenced to ground (like LED drivers), buck-boost converters with a single switch and rectifier can be used. In most cases, the output voltage is then referenced to VIN. Many other power management components use one of the four topologies: LDO, BUCK, BOOST or BUCK-BOOST. Applications that require very large switch currents (i.e. > 10A) will most likely use external switching MOSFETs in combination with a buck controller or boost controller. These configurations are often used in power converters with output powers larger than 25W. 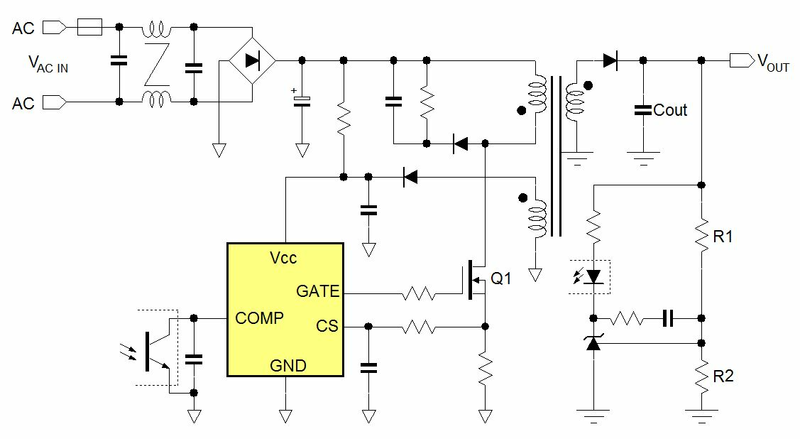 Buck applications with output currents > 25A will use Multi-Phase Buck controllers to share the current over different phases. When driving high numbers of LEDs like in LCD backlighting systems, multi-string LED drivers are used. In some off-line LED drivers, linear LED driver topology is used. Most LED drivers will also include dimming functions, to be able to control the output current, thereby controlling the LED light output. 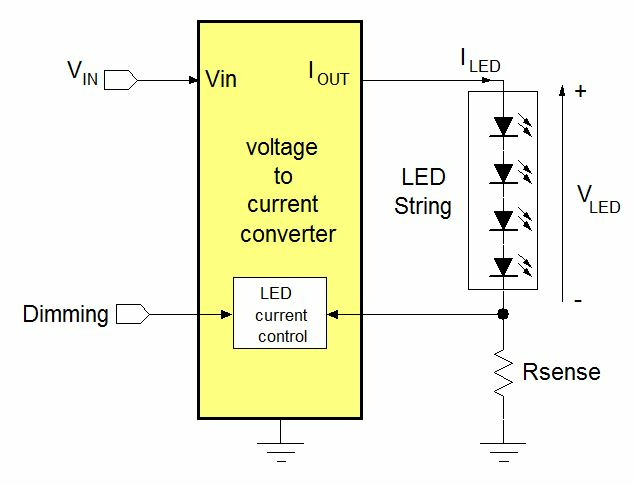 Key parameters for selecting LED drivers are input voltage, LED string voltage and LED string current, single / multi-string LEDs and dimming. In LED drivers powered from the AC line, it is also important to know whether the application needs to be isolated or non-isolated, and whether the LED driver needs to fulfil power factor and THD requirements. Safety and reliability are important aspects of power supplies. Most converters will include protection features which safely shut down the supply in case of overload or too high operating temperature. Power switches can be used to enable and disable power rails. The basic circuit is shown in figure 7. The EN pin is used to activate the pass element which is usually a MOSFET with a special well construction to eliminate reverse current flow via the body diode. A current limit circuit will open the switch when output current exceeds the current limit threshold. The FAULT pin will be pulled low in case any of the protection functions is activated, and can be used to signal the system that a fault condition has been encountered. Power switches are often used to protect USB ports, which have specific maximum current requirements and must be short-circuit proof. The main selection criteria for power switches is the current limit level, which can either be fixed or adjustable. Supply supervisor ICs will monitor a supply rail for over- or under-voltage conditions. Figure 8 shows a typical supply supervisor that checks for supply under-voltage conditions. When the supply rail drops below a certain level, the IC will initiate a reset signal. This signal can then be used to reset the MCU that is fed by the same supply rail, to avoid any data corruption that could occur due to too low MCU supply voltage. When the supply voltage recovers to normal levels, the supervisor IC will remove the reset signal with some delay, to ensure correct MCU initialization. Some supervisor ICs have a manual reset pin as well, that can be used to reset the MCU via an external reset switch. Selection criteria for supervisor ICs are voltage threshold, reset delay time, open-drain or push-pull output, and options like manual reset. Battery charger ICs can be used to provide the correct charge current and voltage for the specific battery cell in your application. Most battery chargers are designed for Li-Ion batteries since these most popular in hand-held equipment. The battery charger will measure battery charge current and battery voltage, and controls the pass MOSFET in such a way that the charge current follows the required battery charge operation modes: pre-conditioning - constant current - constant voltage - current cut-off. The maximum charge current can be programmed by an external resistor, and an NTC coupled to the battery will send the battery temperature information to the charger. Charge status pins will signal the charge condition. Most linear chargers for single cell Li-Ion batteries are fed by 5V supply, and are normally used for charge currents up to 1A, for battery cells up to 1Ah. To charge larger capacity cells, higher charge currents are needed. In this case switching chargers (buck topology) must be selected. Some battery chargers contain Power Path control, which allows the system to be run from either the adapter or the battery. Battery chargers can be selected on linear/switching topology, single/dual input, fixed/adjustable current, with/without NTC sense, adapter input current limit, Auto Power Path. AC/DC flyback controllers are used in application where a stable, isolated supply voltage needs to be derived from the AC line voltage. Figure 10 shows a basic flyback supply. The AC line voltage is first rectified to a high DC voltage. The flyback supply works similar as a single switch buck-boost, where the inductor is split to form a transformer. The flyback controller controls the ON time of the high voltage switching MOSFET Q1, which then magnetically energizes the transformer via a current through the primary winding. When the switching MOSFET is OFF, the transformer energy is transferred to the secondary winding, thereby charging the output capacitor. The transformer will also provide the isolation between primary (hot) side and secondary (cold) side. The secondary output voltage is sensed with a resistor network, and compared with a reference. The regulation feedback signal is then transferred back via an opto-coupler to the primary side controller, which adjusts the ON time of the MOSFET to maintain a stable secondary output voltage. The flyback controller is fed from an auxiliary winding on the transformer. Flyback supplies can be used in a wide range of applications, from tiny charger adapters to larger main supplies up to 100W. In applications that require low input power in standby mode, it is necessary to reduce the switching losses of the power components. Most flyback controllers accomplish this by switching to special burst mode operation in light load conditions. Other important features of flyback controllers are the protection modes, EMI reduction methods and high voltage start-up circuits for fast start-up. Flyback controllers for lower power applications like charger adapters often make use of Primary Side Regulation (PSR): These controllers don’t need the opto-coupler and feedback network at secondary side; they sense the switching voltage in the auxiliary winding, and derive the secondary output voltage from the aux switching waveform and primary current. Power supplies with ratings above 75W (like open frame industrial supplies) need to meet power factor requirements, and a PFC boost is added as a pre-conditioning stage. The PFC boost stage will use a PFC controller, which controls the input current to meet PF and current harmonic requirements. Many isolated off-line LED drivers also make use of flyback topology, and these LED flyback controllers use primary side sensing to control the current in the secondary winding for accurate LED current control without the need of an opto-coupler. AC LED lighting applications have strict requirements on Power Factor (PF) and AC line current harmonics, so most off-line LED flyback controllers also include functionality to achieve good power factor and low THD.